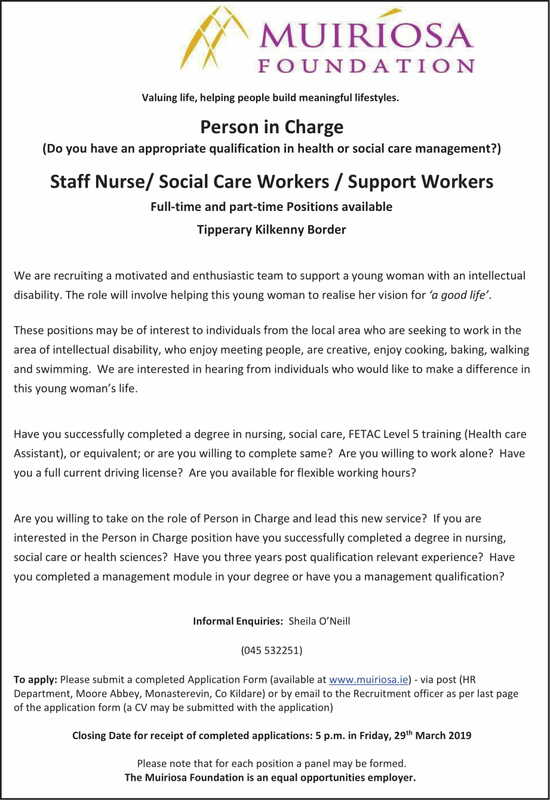 The Muiríosa Foundation are presently recruiting a Person in Charge plus Staff Nurse/ Social Care Workers / Support Workers for full-time and part-time positions in the Tipperary/Kilkenny area. They are putting together a motivated and enthusiastic team to support a young woman with an intellectual disability. The role will involve helping this young woman to realise her vision for ‘a good life’. These positions may be of interest to individuals from the local area who are seeking to work in the area of intellectual disability, who enjoy meeting people, are creative, enjoy cooking, baking, walking and swimming. They are interested in hearing from individuals who would like to make a difference in this young woman’s life. Assistant), or equivalent; or are you willing to complete same? Are you willing to work alone? Have you a full current driving license? Are you available for flexible working hours? Are you willing to take on the role of Person in Charge and lead this new service? you completed a management module in your degree or have you a management qualification? Closing Date for receipt of completed applications: 5 p.m. in Friday, 29th March 2019.